(Update 5/18/17) On April 24, 2017, the DCI announced that Gush was re-restricted in Vintage. Despite this, Understanding Gush remains a relevant, timely, and invaluable resource for any Vintage player, beginner, or expert. Even restricted, Gush will continue to power a significant and high achieving part of the Vintage metagame, as Stephen demonstrated by Top 8’ing the April 2017 Magic Online Power Nine Challenge with Jeskai Mentor. As recent tournament results illustrate, Gush is prominently featured in a wide cross-section of archetypes in the current and foreseeable Vintage metagame. While the GushBond engine has suffered a fatal hit with the restriction of Gush, the Dack-Delve draw engine was already the preeminent draw engine in Gush decks after Khans of Tarkir, and even with Gush restricted, this draw engine remains one of the strongest draw engines in the format. The guidance provided here on how to design, play, metagame, operationalize, or combat Gush strategies remains vital to success in Vintage. 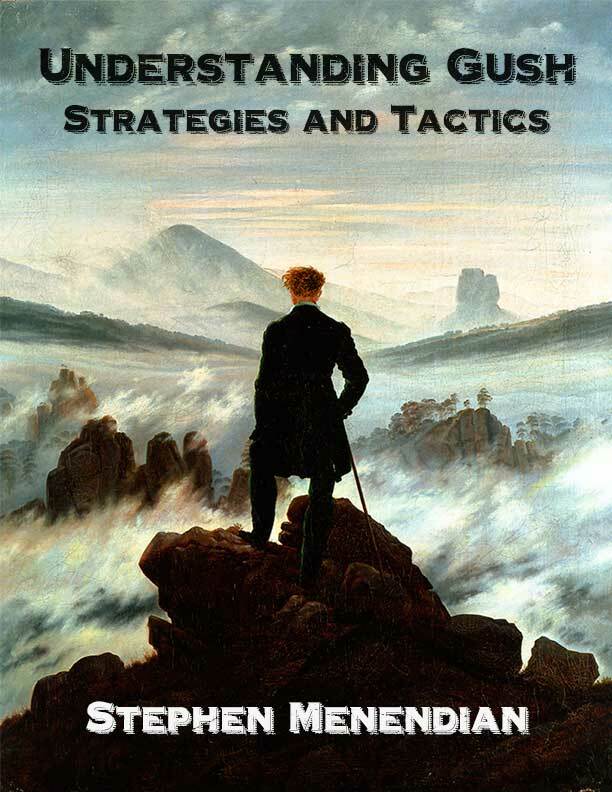 Eternal Central is proud to present to you Stephen Menendian’s Understanding Gush: Strategies and Tactics (3rd Edition). The Digital Download PDF is approximately 350 pages, while the physical hardcover and paperback versions have been reformatted specifically for full-color print, and come in 6×9 trim size (402 pages). All of our books are printed on high quality acid-free 70 lb. paper for longevity. Hardcover books are printed with a matte finish case laminate hard cover. Paperback books are printed with a matte finish perfect bound cover. Author Stephen Menendian is your personal guide to Gush strategies and a wide-ranging tour through Vintage past, present, and future. Persistently misunderstood and generally misplayed, Gush requires many simultaneous decisions and precise timing. Maximizing all of the advantages offered by Gush demands deep understanding and strategic insight. This book presents a comprehensive theory of Gush, all of the advantages derivable from Gush, and a complete range of strategies and tactics. At a time when Gush decks have never been more central to the Vintage metagame, this book is a timely and essential primer to one of the most sophisticated and challenging strategies in the Vintage format. Reorganized and expanded with hundreds of pages of new content, this book widens its scope, and has been carefully re-written from the ground up to provide better guidance, more precise analysis, and clearer explanations. No stone is left unturned, as every aspect of Gush play, design, and theory is covered, including an archive of the greatest Gush decks of all time, nearly a dozen Gush decks designed for the contemporary metagame, and a special appendix on Doomsday strategies, with more detailed descriptions of Doomsday piles than ever before. Beyond the specificity, detail, and practical guidance for Gush pilots, this book explores the Vintage format as no other author has ever done before. Whether they wish to learn about Gush decks, learn how to defeat them, or simply to deepen their understanding of the format, Understanding Gush is a timeless classic with lessons that resonate across the history of Magic, for the aspiring Vintage player, or seasoned pro.